Although this new book is on sale from January this year, we are happy to officially say our words of gratitude to Kevin Beaver and advise it to you. In his book Kevin insists that the best way to really understand how to protect your systems and assess their security is to think from a hacker’s viewpoint, get involved, learn how systems can be attacked, find and eliminate their vulnerabilities. It all practically amounts to being inquisitive and focusing on real problems as in contrast to blindly following common security requirements without understanding what it’s all about. Kevin extensively writes on the questions of cracking passwords and weak encryption implementations in widely used operating systems, applications and networks. He also suggests Elcomsoft software, in particular Advanced Archive Password Recovery, Elcomsoft Distributed Password Recovery, Elcomsoft System Recovery, Proactive Password Auditor, and Elcomsoft Wireless Security Auditor, as effective tools to regularly audit system security and close detected holes. In this guide Kevin communicates the gravity of ethical hacking in very plain and clear words and gives step –by- step instructions to follow. He easily combines theory and praxis providing valuable tips and recommendations to assess and then improve security weaknesses in your systems. 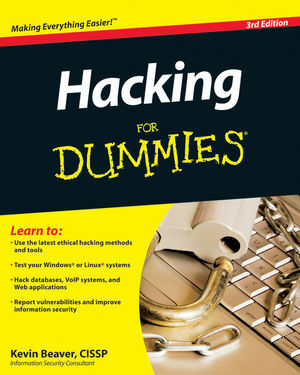 We want to thank Kevin for testing and including our software in his very “digestible” beginner guide to hacking and recommend our readers this book as a helpful tool to get all facts in order.